High Frequency Transformer | Matrix Transformer | Coil Winding Specialist Inc.
CWS has been providing state-of-the-art electronic magnetic components for more than 30 years. Starting as a simple design center for inductors, chokes, coils and transformers, we now design and manufacture electronic magnetic components including: air coils, common mode chokes, transformers, inductors, solenoids and more! If you’re looking for a top performing high frequency transformer, then look no further than CWS. 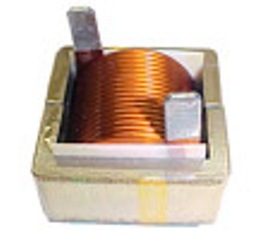 We can provide you with a custom, high frequency transformer built to last and built to endure. We use the matrix transformer concepts at the center of all of our high frequency transformer designs. Conventional transformers use single core with windings on the same core. With matrix technology, however, a single winding on multiple cores is used and is able to maintain the same turn ratio as the conventional method. This greatly reduces the number of windings used in the core and creates a more powerful, reliable, and durable product. All of our products at CWS come with an excellent service plan which features access to custom engineering solutions and technical support. If something goes wrong with a product, simply talk with one of our live, highly trained customer service technicians and they will match you with the appropriate department. For custom designs, we offer customers access to our engineers, designers, and manufacturers. Our team can piece together design configurations based on engineering observations. A sample product can be shipped within 24 hours for inspection and initial use. Once a design is approved, drawings and designs are sent to the customer to be finalized. Products like a high frequency transformer can be shipped in small or high volumes. Call us today at 800-377-3244 to discuss your transformer needs.